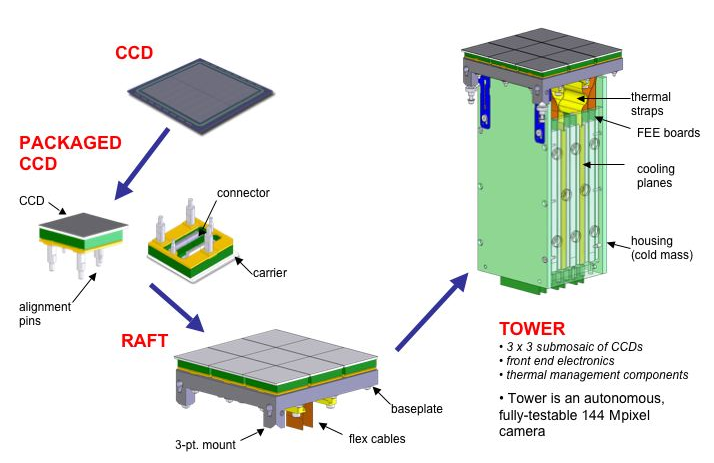 To create the LSST camera's focal plane array, 21 rafts, each comprising 9 CCDs, are mounted on towers containing the necessary electronics, and the towers are assembled into one unit. The charge-coupled device (CCD) sensors that makes up the LSST camera's focal plane are mounted on 21 platforms called rafts, with each raft comprising a 3x3 square of sensors, for a total of 189 CCDs. Each CCD is built up of 4096 horizontal and 4097 vertical (4K x 4K) imaging elements, and has 16 outputs, adding up to a total of 144 channels per raft and 3024 channels across the entire focal plane array. Each identical raft is mounted on a tower, which also holds the front-end electronics for data readout mounted in the shadow of the 3x3 sensor array to minimize gaps between sensors. High-density, flexible cables in each tower carry data from the sensors to the back-end electronics responsible for collecting the data, converting it to a digital format, and transmitting it to the data acquisition hardware and software. Cooling straps connect the sensors to cooling planes that keep the raft at about -100°C to help prevent noise in the sensors. Each raft is an autonomous object and can function as a complete camera, individually controlled via the Observatory Control System. Rafts can also be grouped. Each raft is connected to a single timing and control module, while all rafts are synchronized across the focal plane array. Each CCD can capture eight megapixels of data per second, for a total of 3.2 gigapixels every two seconds.